Cecil Barker was born July 31, 1899 to John and Josie Barker in Iuka, Kansas. He seems to have had relatives in this area. He attended the normal training to become a teacher in 1913. Julia Britton who will be mentioned in my next blog was in his class. In 1914, he was a teacher in District 4, sometimes called the Benish School, which was located close to Offerle in Hodgeman County. The following letter was published in the March 21, 1918 issue of the Kinsley Graphic. It was written to Lena Burkhart who was about 17 years old at this time. Cecil does not mind showing a little homesickness in it for his friends and family back in Kansas. The “chow” mentioned in the letter seems to be a new term for food or a meal as it is put in quotations. It is Chinese pidgin English from the Chinese word “chow-chow” meaning food. It came into use when the Chinese were brought to the west to build the railroad. Many of them settled in California. The term was foreign to Kansas boys and will be seen again in quotations in other letters from the sailors and soldiers who spend time in California. I was so surprised and so glad to get a letter from some friend in Kansas that I am going to answer your letter right away. Lena, you don’t know what it meant to me to get a letter from one of my school pupils of long ago. And especially when I’m in the navy. It shows that I am not entirely forgotten by those I am interested in. It makes me feel good. I’m going to tell you all about what the sailor boys are doing here. 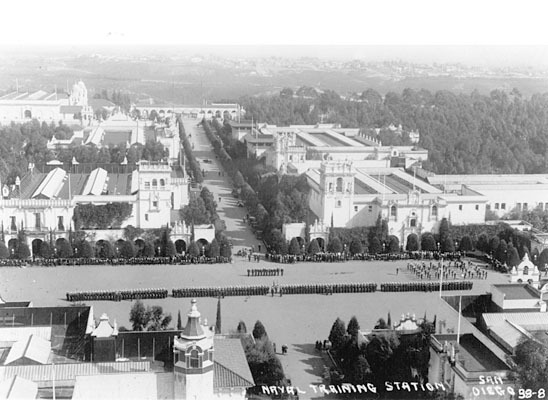 This is the old world’s exposition grounds in San Diego and has been turned into a training camp. The sleeping rooms are very large. Each one holding 1,500 men. We tie our hammocks to rafters and sleep that way. Have had some good falls but so far have always been on top. Couldn’t go to one of those barn dances back there and then come home and try to sleep in a hammock. It would be a pretty rocky boat. Ha, ha! Every street is paved. There are flower gardens, lawns, nice trees and bushes everywhere around us. We have a big lily pond that has been turned into a swimming tank. Say, you should sure like to see the boys eat ‘chow’ meals; lots of people drive up every day. We eat in the open, right in one of the streets on long table about two feet wide and sit on benches. Sailors wait table and all we have to do is to stick out our plates. They feed us fine, butter every day, every now and then pie, cake, salads, cocoa. Had a fine turkey dinner with shrimp salad, mashed spuds, gravy, celery, cake coffee walnuts and oranges for Washington’s birthday. I have been in the navy since April. Was in San Francisco bay a month. Was then sent down here to a dental office and have been here since. Like this place fine. We have good weather all the time but even at that I wish I was back there walking across Mr. Domme’s and Lobel’s field in snow up to my knees, and carrying some books to my little school. Sometime, Lena, I am coming back to good old Kansas and see you all once again. Will everybody remember me, I wonder. Have thought a great many times of all my good little pupils and friends. I like them all. Do you remember all the pictures we used to take. I have a little book of them, and I look at them once in a while. Write me a long letter soon, and tell what all our classmates are doing now. Would like to get letters from them and I certainly will answer. This entry was posted in Uncategorized on March 26, 2018 by Joan Weaver, Kinsley Library Director.